We have gone through the border crossing, and we are now…..South of the border. Our Mexican adventure has begun. Excitement is in the air! The beaches are amazing. Beautiful blue beaches call for further exploration. You can spend hours just walking the sand. This is the time to enjoy all that nature has to offer. If you are looking for unspoiled beaches, private resorts, or just private clean beaches, you will enjoy the beaches of Baja California. There are many motels, RV resorts, and condo’s waiting. Whatever you are looking for, you will find……. South of the Border! Rosarito is located just a short 20 minute drive south of the border from San Diego, California. This romantic beach is perfect for a short getaway. Close to the border, with amazing scenery, Rosarito Beach has it all. Located between the Pacific Ocean and the beautiful foothills of Baja, it makes for some spectacular photography. This is one of the leading Baja resort towns. It is easily accessible to San Diego. Come spend the day on the beach. Enjoy a romantic dinner for two. Join a party in the evenings. Rosarito Beach is a special town, that has it all. Excitement is endless in this completely modern Mexican town. You will find beautiful 3 star to 5 star accommodations just a stone’s throw away from pristine beaches. Americans come to Rosarito seeking a peaceful place to retire in the many romantic and beautiful oceanfront retirement communities. Families come to vacation in some of the most beautiful condominiums in the America’s. The many adventurers come to explore these exquisite beaches, just perfect for the adventure traveler. Still others, flock to the many seaside restaurants for the perfect lobster, or the catch of the day. And then there are those who come to mingle with the locals. They love to practice their communication skills. One of their favorite pastimes is to sample the authentic Mexican cuisine. It is all waiting for you, in Rosarito, just South of the Border. 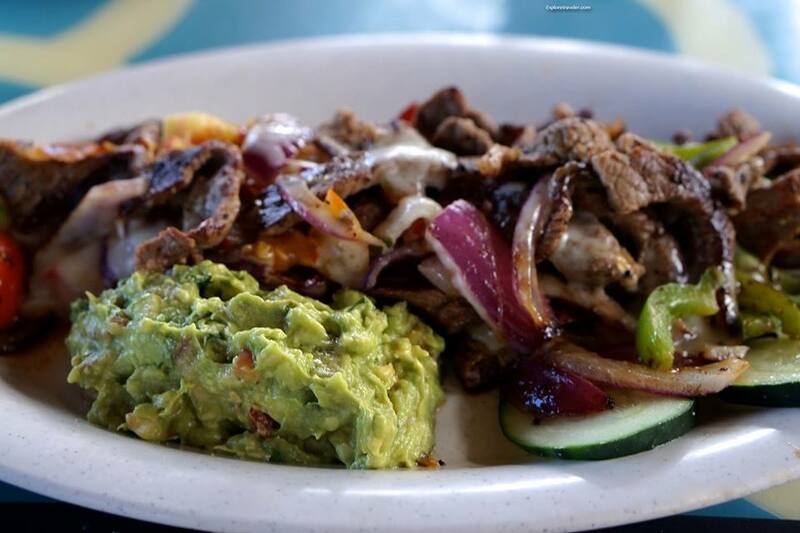 Authentic Mexican Beef Arrachera with Guacamole, is only one of the exciting temptations waiting for you in this Mexican community, just South of the Border. There is no reason to go hungry in this land where the food is immensely delicious. So come on South, and relax! Enjoy the creations of some of our best local chefs. Come hungry, and leave happy! Tijuana is the perfect place to spend that special time with friends. Whether you come as a group of friends or you meet new ones, shopping is fun and exciting. Few are the women, that can resist an exciting trip to Tijuana’s Leather Factory. Even the men get excited about shopping at the Leather Factory. Here you will find all those hard to find leather good you have been looking for. This is a shoppers paradise! Bargain shopping for quality handmade leather goods in Tijuana, Mexico is a delightful experience. Are you looking for that perfect purse? Here, you can choose from the hundreds of quality handmade leather purses. Need a new belt or the perfect hat? If it is leather, you will find it at the leather factory. Looking for something unique and original? Explore the selection of spectacular sheepskin coats, western styled vests, or that special crocodile wallet. Need a new pair of boots? The boot selection is endless! From the moment you leave the border, you will find leather everywhere . The Leather Factory is only one of the many shops that specialize in leather goods. Just seconds after you pass through customs, you will find everything leather. Everything from laptop cases to cases for your passport are available. Boots are an exceptional bargain at prices about half of what you would pay in the states for the same item. Here you will find every kind of leather from alligator to ostrich, and every style you can think of. One of the leading bargains in boots are the bulls-neck. You can often save $40.00 a pair over San Diego prices. Don’t be afraid to bargain, it is part of the fun. Bargaining is a way of life in Mexico. Tijuana is considered the leather capital of Mexico. The selection of leather goods is endless. The competition is fierce. The bargaining is the spice of life. Take a walk up and down Avenida Revolucion for some of the best inventory at spectacular prices. Shopping in Mexico is not limited to the shops or major stores. You will find exciting adventure in the streets and byways. Wander the alleys, greet the people, and enjoy the real Mexican experience. Try out your Spanish and they will try out their English. The two will meet in the middle. This is the art of International Communication. Don’t be afraid to speak, they will love you for trying! Reach out, and make a new friend! Shopping has no boundaries, and it is an art to be enjoyed! One of the unique and traditional items of Mexico is the bright and colorful pottery. This is a tradition that goes back thousands of years. Each pot is one of a kind. The individual pots are handpainted with beautiful designs. These clay pots are durable and will last for years. They make an exciting conversation piece for your patio or poolside. What amazing conversations will be generated! If you want to come home with something that is unique and different, then this amazing pottery is just the item. The music is sweet, as a man and his violin play in the Village of Puerto Nuevo, Baja California. A wonderful instrument in the hands of the master. Amazing what you can find in the byways and alleys of small Mexican towns. While there are locations for professional entertainment, here on the street…….. the music plays! Las Olas Resort And Spa, is a beautiful upscale 4 star condo resort right on the beach. It is close to the border and not far from the famous statue of Sagrado Corazon De Jesus. This is one of Rosarito’s top resorts. Beautiful 2 and 3 bedroom condos with a touch of island charm. They come complete with beautiful kitchens, nice sized living rooms, and beautiful marble bathrooms. You will even find a deep soaking tub, TV, and washers and dryers in each condo. The balconies wrap around the building providing for spectacular ocean views in every direction. Many of the condos even have their own private infinity pool. The resort has a large outdoor pool and whirlpool. There is a complete exercise and spa facility. These facilities even have a cold plunge pool. Do you dare to take the plunge? Reservations can be made on their website or by phone. The utterly amazing Las Rocas Resort and Spa is another one of the beautiful 4 star hotels in Rosarito, Baja. Located at the top of the cliff, the view is spectacular. It is also close to the famous statue of Sagrado Corazon De Jesus and is a short drive from Los Arenales Beach. At Las Rocas, you will find amazing rooms with magnificent views. TV, WiFi, and balconies come with all the rooms. There are no air conditioners, but nature provides nice pleasant breezes. There are suites available with romantic fireplaces for those cooler evenings. The suites are complete with kitchenettes with microwaves and small refrigerators. If you desire to stay in one of the one bedroom penthouses, you will even have a private Jacuzzi. Room service is offered in all their rooms. You can make your advance reservations online or by phone. This is top quality resort at medium hotel prices. The Tijuana Marriott Hotel is next to the Country Club and the Culture Center is near by. This 4 star hotel has everything that you would expect to find in a hotel of this class. The rooms are cozy and comfortable. You will have Wi-Fi ( for an added fee), a flat-screen TV, a safe. Each room is complete with a beautiful marble bathroom. These are some of the standard amenities. Some rooms have balconies with views looking out over the beautiful golf course. Executive rooms have access to a private lounge. Here you will find free drinks, free breakfast, and free snacks. Cribs are provided to all rooms that have a need for them. Room service is also available. There is a quality restaurant on site and two cocktail lounges. Both local and international cuisine is served. Guests can enjoy the outdoor pool and the beautiful picnic area. Lunches can be ordered to go. If you are looking for quality, you will find it, at the Tijuana Marriott Hotel. Reservations can be made by phone or on their website. The Grande Hotel Tijuana is an upscale 5 star hotel near the busy and exciting Avenida Revolución thoroughfare. You will also be close to the Tijuana Cultural Center. Wifi and TV are free in all rooms. There are mini bars and desks in each room. You can upgrade for rooms that have complete living areas and kitchenetts. Room service is available in all rooms. A breakfast buffet is available for an additional fee. There is also a casual restaurant, bar and night club. There is a nice outdoor pool, a fitness area, hot tub, and a spa. You will find everything that you would expect in a 5 star hotel. Reservations can be made online or by phone. The Tijuana Cultural Center is home to the only IMAX cinema in Tijuana. The cinema has been part of the Tijuana Cultural Center since it opened in 1982. Daily it plays different cultural and scientific shows. It is currently adding about 4 shows a year. There is also an exhibit on the history of the Californias. It presents the history of both the State of California and Baja California. There is also a theater that is mostly used for private concerts and plays. There are many spaces for different short term exhibits, video rooms, cafe, and bookstore. The center is complemented by a beautiful garden with a coffee shop outdoors. The Tijuana Cultural Center is also home to many international films and exhibits. This is the only cultural and arts center outside of the capital. There are many art and cultural classes, including some with certificates of completion. There are many summer courses, workshops, and hands on art classes. This is a cultural center for the people of Tijuana, as well as visitors, and is extremely popular. The Tijuana Cultural Center is open daily from 9 am till 9 pm. As you are leaving the United States of America in root to Ensenada, Mexico you must pass Rosarito. Just a few short miles south is El Morro. Look toward the mountains and you will see a towering figure of Jesus Christ. The figure is 75 feet tall and looking out toward the sea. It is called Cristo del Sagrado Corazon (Christ of the Sacred Heart) statue. This is a major landmark. It is worth stopping to see this amazing piece of artwork. You will also see a long Boardwalk along the beach at Rosarito. Here you will find miles of beautiful beach. The views from the Boardwalk are extremely beautiful. Take a little extra time, drive down the main street of Rosarito and see all the quaint little businesses set up in small tents. Get out and go for a walk. Enjoy the sights and sounds, and most of all, mingle with the people. The people are friendly and eager to have a conversation. They love to try out their English. They are happy when you try out your Spanish. A few words goes a long ways! This is a short day trip from San Diego, or you can spend the night in 4 and 5 star hotels for the price of a small cheap motel in San Diego. Spend the day, or spend the night. Adventure is waiting…… South of the Border.